Puddings are very popular dessert known all over the world for their rich flavor and delicious tastes. Puddings can be best called as desserts. But some consider them as a savory dish also. Here is a recipe for the quick preparation of delicious baked boost pudding. Try this recipe and let us know your comments and thoughts. In an aluminium cake tin/pudding tin, add 1 tablespoon sugar and keep in very low flame on a stove. Let it melt and change the colour to golden brown. Swirl it evenly to reach all parts of the tin. Keep aside. Let it cool n crystallize. In a mixer jar add 3 tablespoon sugar, 1 teaspoon boost, 1 egg, 1 cup milk and blend well. Pour this to the caramelized tin. Repeat the same process until 3 eggs are done. Add vanilla essence and sprinkle chocolate chips on top. Bake the pudding for about 45-50 minutes or until done. (Baking time may vary according to the voltage and the capacity of the oven). When its baked, transfer the tin to a wire rack. Run a knife around the sides and de-mold it. 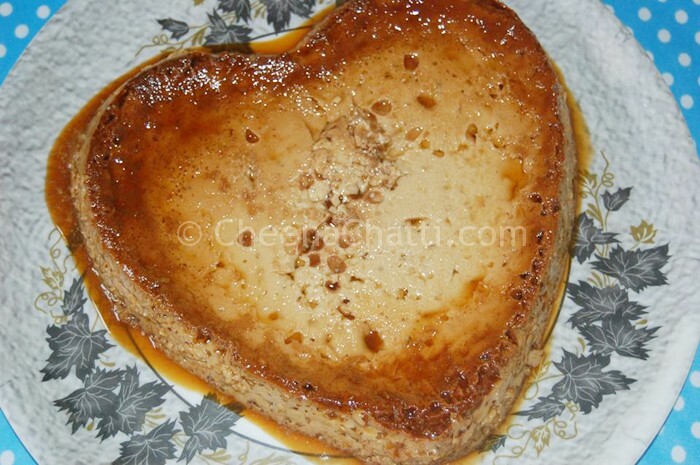 This entry was added on August 14th, 2013 by Athira Sooraj in Desserts and tagged with baked pudding desserts, pudding recipe, milk pudding, baked pudding recipe, boost pudding, quick easy baked pudding recipes, baked chocolate pudding, easy pudding, tasty pudding. Last revised on April 4th, 2018. 🙂 Its an ec one.. pl try out. Tried this recipe….. it came out wonderfully well. Thanks a lot. Tried the boost pudding recipe. It came out wonferfully well. Thanks a lot.